The folks at CNN received waves of criticism this week after running a chyron that included the phrase, "If Jews Are People." On The Lead with Jake Tapper, anchor Jim Sciutto interviewed two media correspondents about the alt-right movement-aka racist, white nationalists-and their unrelenting support of President-elect Donald Trump. The guests were asked if Trump should formally condemn support from the movement. At one point in the interview, Sciutto characterized the group's rhetoric as "hate-filled garbage" and read a quote from alt-right leader Richard Spencer, "One wonders if these people are people at all, or instead soulless golem." 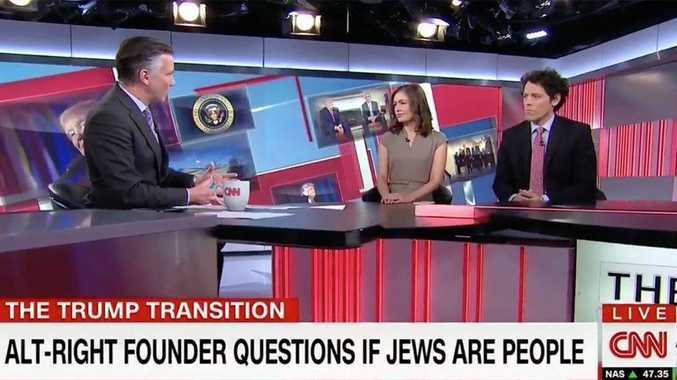 And for some reason, a producer thought it would be a good idea to run the lower third, "Alt-right leader questions if Jews are people," underneath both interviewees, Rebecca Berg of Real Clear Politics and Matt Viser of the Boston Globe. Backlash over the graphic was swift and widespread, with many viewers noting that just because someone voiced a disgusting, anti-semitic statement, doesn't mean you should ever run it as the chyron underneath your guests. Jake Tapper, who was trying to enjoy his day off, immediately condemned the graphic online and called into his show to tell producers it was unacceptable. "I'm off today but that chyron is unacceptable and I immediately called my staff to convey that," he wrote on Twitter. He continued tweeting upset viewers on Monday night, "the chyron was abhorrent and I am trying to deal with it. Obviously, I take responsibility but my being off is not irrelevant." Sciutto also said that he fully agrees with his coworker, "however that the banner-which we don't write from the chair-was out of line." View the entire segment below along with more reaction on Twitter.